Mckesson Regular Underpads, manufactured by McKesson, are moderate absorbency underpads that contain a super absorbent polymer. 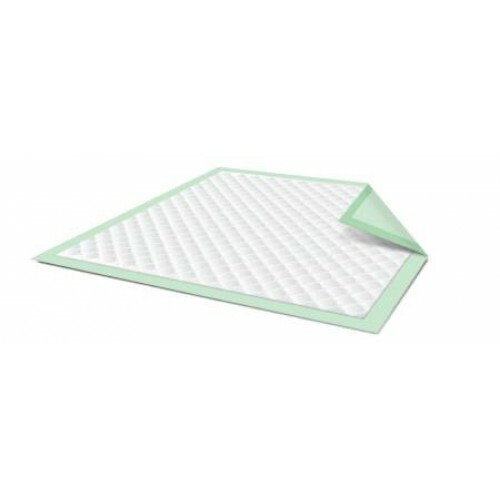 Disposable Underpads are designed with triple layers of protection. The non-woven top layer allows moisture to pass through, this feature help to keep the skin dry. The middle layer of the underpad is composed of a super absorbent polymer fluff. The bottom backsheet layer is a green waterproof layer. This backsheet is what keeps the bed dry. Non-woven top-sheet allows moisture to pass through quickly. Really like the size and convenience of these disposable, water proof underpads. Saves me time with cleanup after daily wound dressing changes. Prompt shipping by Vitality. We thank you! I have been using these disposable pads in my esthetics practice for well over a year. They are cost-effective, sanitary, single-use without any fuss. Clean-up after a wax client is a breeze. Clients appreciate the fact that I care about sanitation & protecting their health. The telephone contact is courteous, efficient, and always has a "deal". The product is excellent. The delivery time from phone call to my door is an average of four days. Nice going, Vitality Medical! Please bring back the free shipping! These are a great product and they were a affordable before they discontinued their free shipping! Seriously, who can afford 13 dollars just for shipping!? For now, I will be looking elsewhere. Good product for the price; tend to break down a bit but not unusually so. Will definitely continue ordering. I am very satisfied with this product and with Vitality Medicals speedy shipment. Great price, fast delivery and good absorbency! I will definately buy again!